Scientists have been working hard for years in a bid to give robots a sense of touch through some skin, similar to that of human beings. Regular robots are covered with metal. To give the robot a sense of touch, makers need a material that is stretchable, elastic, and also able to send signals. This would give robots the ability to respond to stimuli, sense cold and hot objects and probably be able to know a persons gender by touching them. Making use of traditional semiconductors did not really give the required results. These semiconductor materials required some complex mechanical accommodations and were really costly. It's been a long journey with tech. Some of the things that (once) seemed impossible have now become child’s play though. The AI world has met impossibilities but she is surely breaking through it bit by it. 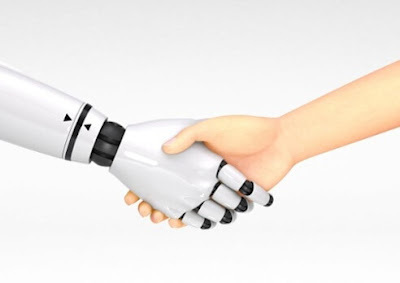 In a recent development, scientist from the university of Houston revealed they have been able to come up with a stretchable material that will be able give robots a sense of touch. What this means is that they have been able to produce a semiconductor material that is able to retain its ‘sensitivity’ even after being stretched by about 50%. Report has it that the material is the first of its kind in the industry. This ‘sensitive’ material was prepared using polydimethylsiloxane – I wouldn’t bother trying to pronounce that. It is a Silicon based polymer regularly called PDMS. The researchers used PDMS and nanowires to create a solution that hardened to form a very useful semiconductor material. The material would be able to stretch without issues and the nanowires used to form them would help in transferring electric current. Truly a great step which will also be a great addition to the wearable tech industry. When robots are able to ‘feel’ what they touch, the possibilities become endless. This is a truly awesome invention but is this the beginning of emotional robots? Drop a comment.